The VCCS' and Germanna's Great Expectations program helps get at-risk foster youth aging out of the system on track toward good-paying careers. Comments from GCC Educational Board member and Great Expectations program supporter Connie Kincheloe is featured in video. Raymond R. Hall, District Manager for Capital One, left, and Bill Fulton, the company's Cosner's Corner Branch Manager, pass the first of two annual checks for $10,000 to Germanna Community College Educational Foundation Executive Director Mike Catell and Middle College Director Carolyn Bynum. GCC's Middle College helps young adults who have not earned a high school diploma get their GEDs and make the transition to regular college academic classes and Workforce training. "If this helps one student become a success in life, it will be worth it," Hall said. "We want to give back to people in the community--to people in our back yard. Ninety percent of our local branch associates were born and raised in the area and we want to make a difference here." "Believe me, this will help more than one person," Bynum said. 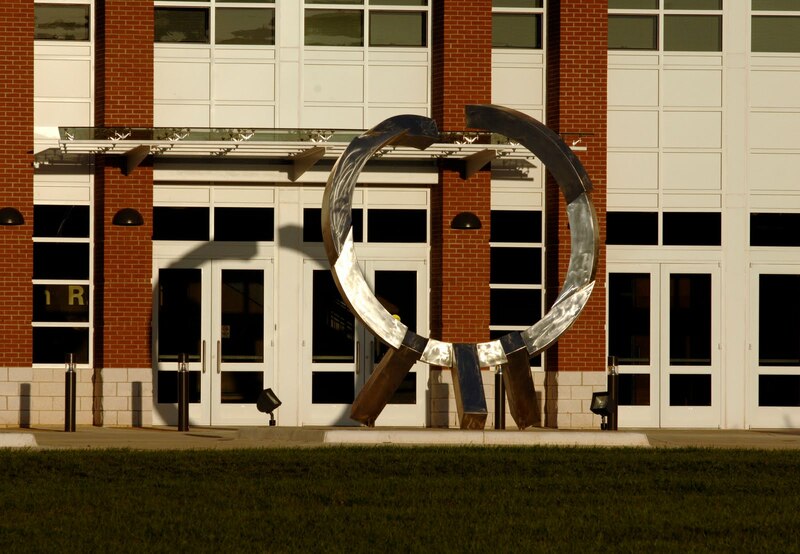 "Germanna and the Middle College greatly appreciate Capital One's support." "We look forward to a long relationship with Capital One," Catell said. Capital One's Fulton said he's gratified that the funds will help "the less fortunate--those that have great need for help-- in the area." The funds will help GCC Middle College programs from across the region, including Culpeper, Madison and Orange. Middle College is not funded by the state and depends on local donations. Culpeper Regional Health System Board Secretary Wayne Hawkins accepts Germanna Educational Foundation Philanthropist of the Year Award from Bruce L. Davis, foundation president. 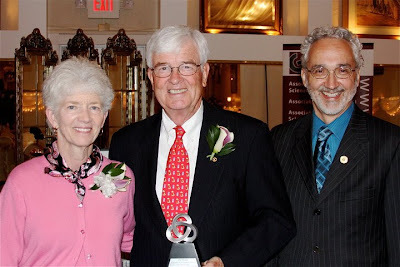 Germanna Community College’s Educational Foundation named Culpeper Regional Health System its 2011 Philanthropist of the Year Friday night at the Lake of the Woods Clubhouse. Culpeper Regional Health System's total investment in its partnership with Germanna over the last 10 years is $539,266, said Mike Catell, Director of the GCC Educational Foundation & Alumni Relations. 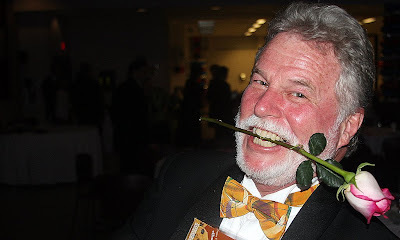 The donations have been been made in the form of scholarships, grants for nursing program development and a faculty position, and contributions to events like Monte Carlo Casino Night and Distinguished Person of the Year, which support the Germanna Guarantee Program. The hospital and its affiliated organizations have also invested in the Jane R. Ingalls Nurse Educator Fellowship. Germanna President David A. Sam said support from partners like Culpeper Regional Hospital has made it possible for GCC to make sure the area has enough nurses as the Baby Boomer population ages and demand for health care increases. Bruce L. Davis, President of Germanna’s Educational Foundation, and a member of its Local College Board, said Culpeper Regional Health System has displayed leadership in the community and vision in its consistent and generous support of GCC. 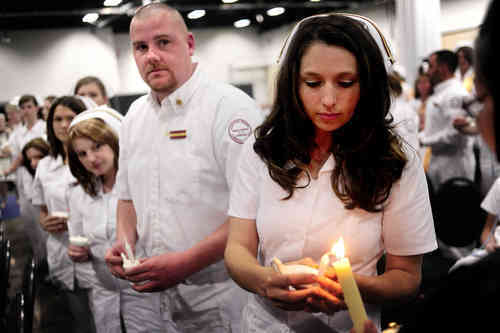 The college doubled the size of its nursing program this year and added non-credit Workforce health care certifications. Meanwhile, the total headcount of students taking classes is approaching 14,000, including nearly 8,000 students taking credit classes. “Enrollment is way up, demand for academic programs and Workforce training is way up, state funding is down, and we need more funding from local partners and donors,” Davis said. Caroline High School student Paige Romeo will walk at Germanna Community College's commencement in May before she graduates from CHS in June. GCC's Dual Enrollment program, which allows students to get credit for college courses at their high schools, has allowed her to leap ahead and save money at the same time. 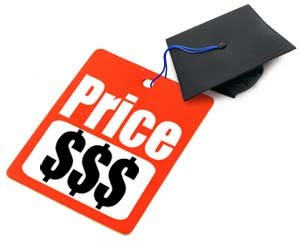 The cost of GCC courses is about one-third of the cost of classes at four-year-colleges and universities. The 18-year-old Romeo is also more comfortable with the idea of going off to college because of her GCC Dual Enrollment experience. She plans to attend Virginia Tech in the fall. "I've gotten a taste of what college is like and still had the (home) support system," she said, adding that she believes it will make adjusting to college life away from home easier. "The experience has been awesome. All the professors have been nice. I thought their expectations might be too much, but all you have to do is do the work." 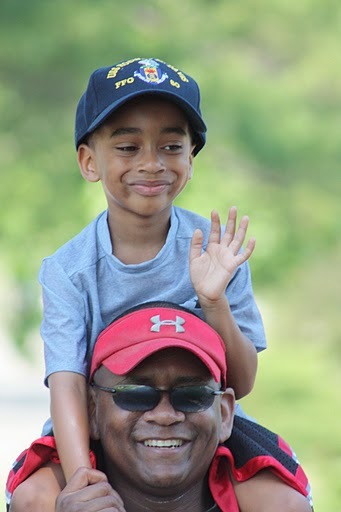 John Hollis with his 5-year-old son, Davis. His "Life in the Paint" teaches people to be themselves. Don't try to be white. Don't try to be black. Just be you. When he was growing up in Fredericksburg, John Hollis found a way to not only live, but thrive, in both the black and white worlds at the same time. His skills in the classroom earned him scholarships to Woodberry Forest and U.Va. His skills on the basketball court earned him the respect of other young black males who considered getting good grades to be "white." He's gone on to write for CNN and Time and to cover professional sports for the Atlanta Journal-Constitution. And his brutally honest book, "Life in the Paint: A Black Man Fighting for His Identity" provides clues on how we can fix one of the major problems affecting our education system. Q: Your dad left and your mom, Phyllis Hollis, a Stafford County teacher, raised you guys on her own, right? She drilled into all three of you the importance of education, didn't she? Have you had contact with your dad in later years--has he congratulated you on your success? JOHN HOLLIS: Yep, my mother (A Howard University grad who has a master's degree in education from U.Va) raised the three of us on her own after divorcing my father when I was very, very young. We were still living in Germany--my father was in the U.S. Army--when their marriage ended and my mom returned to the U.S. with three sons to support. My youngest brother, Rick, was just a newborn baby at the time. I vaguely recall seeing my father once or twice while growing up, but not all since I was about 8 or 9, I guess. He sent two e-mails to me a few years ago in 2003, congratulating me on my success. I never responded back to either of his e-mails, although I did a few years ago speak via phone to the 20-something-year-old son he had by the German woman from his second marriage. I have never hated my father or anybody else for that matter. I truly have no feelings towards him whatsoever. He just wasn’t there when we needed him while growing up, so I don’t need him now. In fact, I look at it as a blessing of sorts that he wasn’t in my life because there’s a good chance I wouldn’t be the person I am today had there been such negative daily influences around me during my formative years. As for my mom, she was always preaching the value of education to us, ingraining in us at a young age that we would be good students, that we would be going to college and that our behavior in the classroom would be as exemplary as our academic performances. As I’ve grown into a man and become a parent myself, I realize how important that was in setting high goals for us and challenging us to meet those goals. All the more so for young black men. According to the statistics, my brothers and I should most likely be either dead or in jail. I’ll be forever indebted to my mother for demanding excellence from us. It’s a lesson from many other people could learn. Q: Do you agree with the messages of Bill Cosby and President Obama that black families need to stress the importance of education more? Q: You say that your ability on the basketball court allowed you to straddle the line and relate to both sides. What do you think would have happened if you didn't have those skills? JOHN HOLLIS: I’m not sure what might have happened if I didn’t have a little game back in the day. That innate confidence to know I could thrive in whatever my environment I might have found myself has been very pivotal for me. I might have turned out differently without the basketball skills, but who knows for sure? Q: You write about other black kids you played basketball with being as smart as you but either being killed or going to jail for selling drugs because they bought into the idea that doing well in school was a white thing. JOHN HOLLIS: I’m not sure that the friend of whom I spoke in the book as being as bright as me ever bought into the idea of studying made you “white.” I always believed this friend “Jimmy” was more a victim of life’s circumstances than anything else. He turned to selling drugs when the single mom raising him and a younger sister became ill. But there are plenty of young black males who don’t have the confidence to dare go against the grain. Often young and looking to fit in, too many black males do buy into that flawed premise, often with terrible consequences. I was always blessed to have lots of self-confidence, and I was determined to never let other people or different environments define me. Only I could define me. Yes, I was different than a lot of guys I played pickup basketball with, but I think I earned their respect because I always had the confidence to just be me and not try to be something else. Q: Sports were a real blessing to you---they not only helped you relate to others who might have shunned you, they got you your start in journalism. But isn't it true that for many, they lead a lot of kids—especially poor kids-- to believe they can succeed without studying? 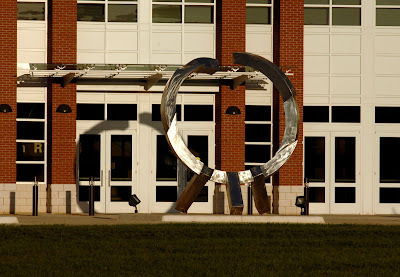 Germanna Community College will offer Federal Direct Stafford Loans beginning with the spring 2011 semester. Federal Direct Stafford Loans are offered through the Department of Education and are being offered as a responsible alternative to private borrowing. Click here for YouTube video about White House Community College Summit. Direct loans are intended to help students and their families offset the rising cost of college tuition. Currently, Germanna offers several types of financial aid to our students including grants, scholarships, work study programs, and private student loans. The college is now able to offer Stafford loans, as well for those students who need additional financial aid to meet their educational expenses. Stafford Loans have lower interest rates, longer repayment terms, deferment and forbearance options as well as early loan forgiveness for graduates working in public service. The Germanna Center for Workforce and Community Education Green jobs conference set for Monday, Oct. 25, 2010 has been rescheduled for Earth Day, April 22, 2011. It's only $20, including lunch. Call 540/937-2900 and register now to learn from experts about opportunities for green living & working through a series of quick workshops including Green Building Professional Development, Green Building Training and Certification Options, Marketing Green Homes, and the Top Ten Home Energy Upgrades for Consumers. Germanna found a perfect fit in its new Dean of Arts & Sciences Deborah Brock, who as a passion both for leadership and teaching. GCC didn't have to look far. she's a longtime Fredericksburg resident. Susan Carol, who runs Fredericksburg's top PR firm, talks about branding during a Germanna Center for Workforce and Community Education class at the Stafford Center. 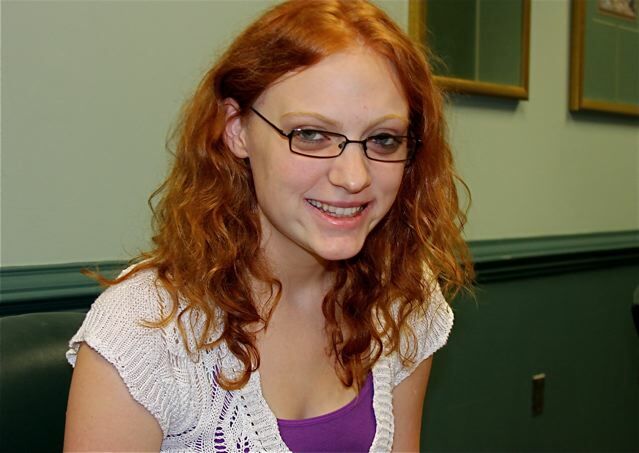 Amherst College has given Devon Geary nearly a full scholarship after Germanna Community College helped her excel academically in spite of entering the school with a rare and debilitating disorder. 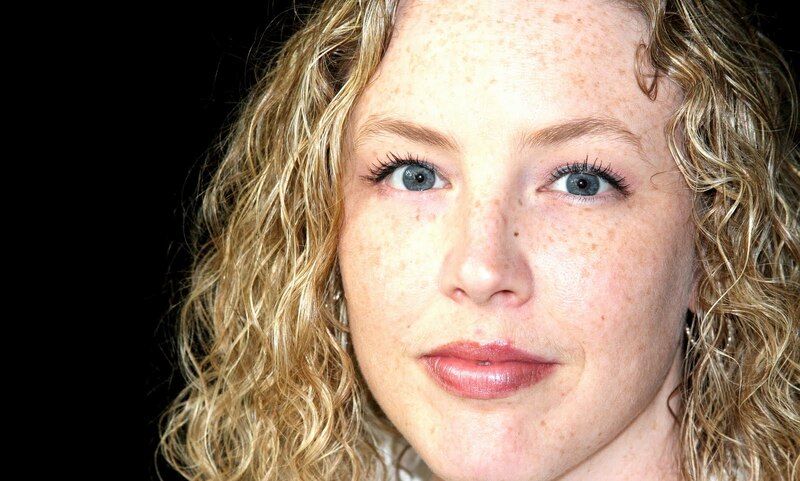 She was so sick in 2006 that she had to drop out when she was a sophomore at James Monroe High in Fredericksburg. She suffers from postural orthostatic tachycardia syndrome (POTS). The rare genetic disorder can be debilitating. For those with the disorder, sitting up or standing can cause heart rates to soar and blood flow to the brain to decrease, resulting in fainting. Some POTS sufferers can't go to school or work. Devon's case is complicated by Ehler-Danos syndrome, which affects connective tissue between joints and makes movement agonizing. At 16, Devon was faced with the prospect of being bedridden or in a wheelchair for the rest of her life. Her doctor gave her little hope. But she refused to give in. In 2008, she came to Germanna in a wheelchair and got her GED. 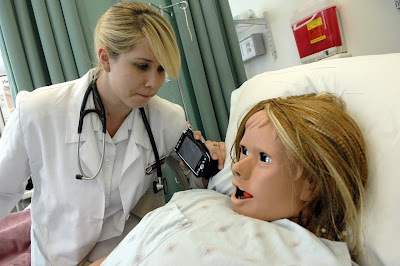 In 2009, she began classes at GCC, using a walker, and frequently fainting. "There was no way I could have gone to a four-year school," Devon says. "I could barely walk. I could barely stay conscious." "I would sometimes find Devon in the fetal position," says Winford Stevens, GCC's Coordinator of Disability Services. She was able to stick with it, she says, because at Germanna, "Nobody stared at me. Nobody laughed at me. I had been in a wheelchair for 2 ½ years. I was used to pity stares. But I didn't get that here. People were very kind and accommodating, but they didn't pity me." 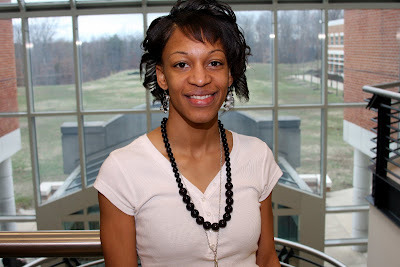 Devon thrived on the kind of one on one attention students get from faculty at Germanna. Her condition gradually improved, and though there is still pain, she now not only walks on her own, but is an assistant dance instructor. The outcome: nearly a full scholarship to Amherst, one of the top liberal arts schools in the country. At Germanna, instead of being pigeonholed, she decided who she was going to be. "If anything, I'm the 6-foot-tall redhead with the 4.0," Devon says. "I was never defined by my illness here and I really appreciate that. I don't know if it would have been that way at a 4-year school," she says. "I think I did pretty well, but it was because of the environment." In the current economic environment, small businesses with shrinking staffs need to find ways to invigorate themselves without devoting a lot of time to retraining. So Germanna Community College is offering a Workforce & Economic Development Regional Business Series that allows employers to enhance skills in a hurry. GCC, which is offering the series in partnership with local economic development authorities and chambers of oommerce, is offering a two-hour course on Branding & Marketing at the Daniel Center in Culpeper from 8 a.m. to 10 a.m. on July 16. There will also be a Branding course on the same day at the same time at the Germanna Stafford Center. Two weeks later, there will be a course titled Develop a Strategic Business Plan at GCC's Fredericksburg Area Campus in Spotsylvania from 8 a.m. to 10 a.m. on July 30. On Aug. 13, there will be a Legal Fundamentals course from 8 a.m. to 10 a.m. at the Caroline County Business Center. And on Aug. 27, there will be a course entitled Develop a Marketing Plan from 8 a.m. to 10 a.m. at the King George Community Citizens' Center. The two-hour courses cost $29. Call 540/891-3012 for more information and to register. "Just Drop It" dropped nearly $160,000 into Germanna nursing program piggy bank. The Culpeper "Just Drop It" Campaign resulted in more than 3,132 pounds lost by participants and a resulting donation of $156,610.00 for the Nursing and Allied Health Programs at Germanna Community College. The goals of helping people to be healthier and better manage their diets were possible through the leadership and support of Culpeper Regional Hospital, Powell Wellness Center, Mr. and Mrs. Joe Daniel and Germanna Community College. Our deep appreciation to Sandy Boone at the PWC, Lee Kirk from CRHS, Greta Haggerty from GCC, Joe and Linda Daniel, and other stakeholders including our faculty and nursing students. And congratulations to all the participants. You won both by becoming healthier and by helping Germanna Community College and its students. James Richardson is a second-generation Germanna Community College graduate who said his father's words inspired him to complete his degree despite self-doubt and challenges. "My father always told me, 'James, you have to do the hard thing,'" Richardson said last night before a crowd of about 2,500 at the Fredericksburg Expo and Conference Center. Richardson, a 20-year-old Falmouth resident, was the community college's student speaker at last night's commencement ceremony. He spoke of the determination, sacrifice and belief in self that were needed to meet the requirements for his associate degree. He spoke not only of his own struggles but also those of classmates who worked full time and who had families. "It takes determination to get up in the morning and go to class knowing that after you're done you have to go work for eight hours so you can pay for your house," he said. "It takes determination to study for a test when you've got kids who want and need your attention." He added that teachers can't teach determination. "It's something that you have to work at and want. It is the difference between those who make it and those who don't," Richardson said. Click here for the rest of the story. Retired Virginia State Sen. John Chichester has been named the Germanna Community College Educational Foundation’s Distinguished Person of the Year. Mary Washington Healthcare is the title sponsor of a June 3 event in his honor. 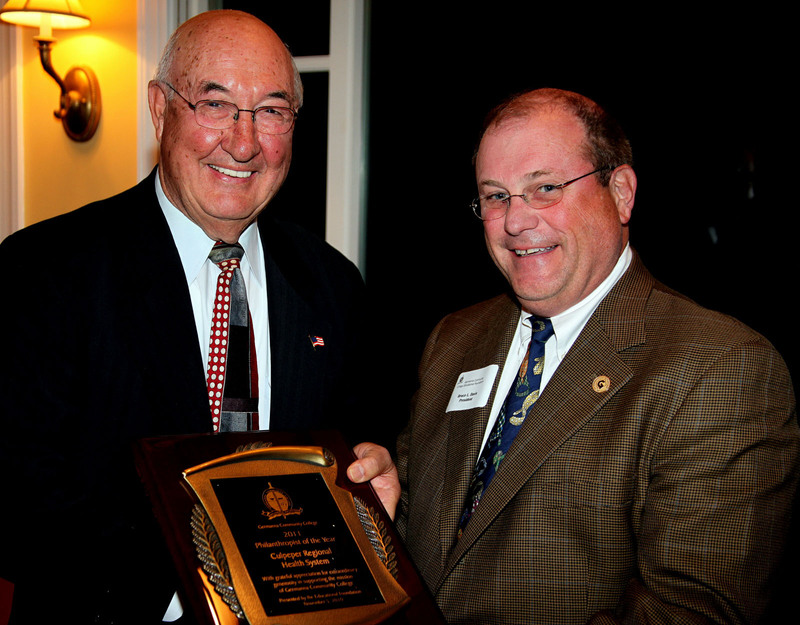 Chichester was President Pro Tempore of the Virginia Senate when he announced his retirement in 2007. He represented the 28th district in the Senate from 1978 to 2007. He initially entered that body by winning a special election following the death of Paul Manns, who had held the seat. In 1985, the Republican Party nominated him for lieutenant governor, but he lost to Doug Wilder, who went on to become Virginia’s first African American governor since Reconstruction. 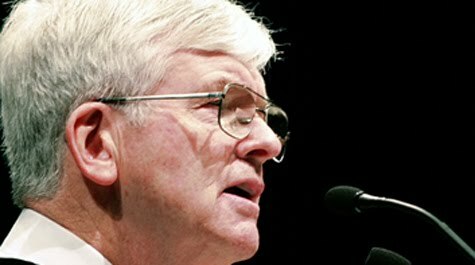 In 1995, Chichester became co-chair of the Senate Finance Committee. When the Republicans took control of the Senate in 1999, he became the committee’s chairman, a position of power and prestige. There will be a 6 p.m. reception on Thursday, June 3 at Fredericksburg Square, followed by dinner and an award presentation. The dinner is $100 a plate, with all proceeds going to the Educational Foundation. Contact the Educational Foundation office at 540/423-9060 or foundation@germanna.edu for more information and to purchase tickets. The deadline for applications to Germanna's Registered Nursing Program at the Locust Grove Campus is July 1. The deadline for the GCC Practical Nursing Program with classes at Eastern View High School is May 7. Call 540/423-9821 or email nursing@germanna.edu or visit the nursing office at the Locust Grove Campus for to apply or to request more information. 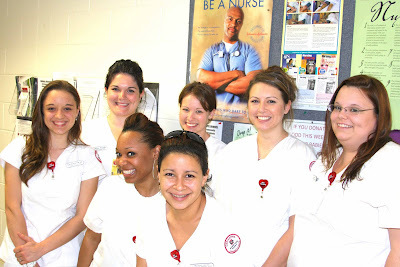 Above: Members of the Certified Nurse Aide class of Spring 2010. The CNA program quickly prepares students to enter the health care field, allowing them to earn a living in nursing while further studies move them up the ladder. The Germanna Educational Foundation raised netted $70,000 with Saturday night's Monte Carlo Casino Night fundraiser at the Daniel Center. All the proceeds go to the Germanna Guarantee Program, which helps students in need. Above, Culpeper native Dana Brill plays the slots at Monte Carlo Night. 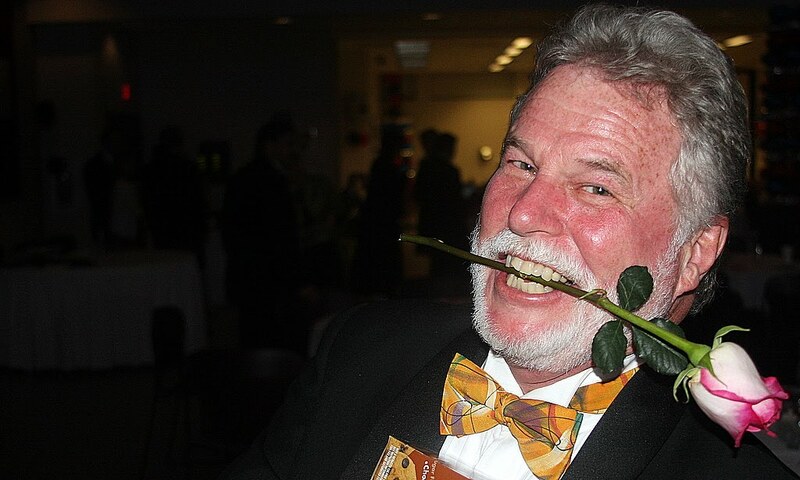 Life itself is a game of chance, says Germanna Community College President David A. Sam. "And Germanna Community College is about second, and even third, chances," he said. A little bit of Las Vegas comes to Culpeper on Saturday, when Germanna Community College's 16th annual Monte Carlo Casino Night returns to the Daniel Technology Center, located 30 minutes west of Fredericksburg, just off State Route 3. But buying a ticket--or even better, a table--for Monte Carlo Casino Night is no gamble, Sam says. It's more than a roll of the dice. Monte Carlo Night is what they would call in Las Vegas "a mortal lock"--that is, at least in terms of helping local students who have financial need, and helping to jump-start the area's economy at the same time by making its work force more competitive. The black-tie event has become a highlight of Culpeper's social season, while providing scholarship funds for the Germanna Educational Foundation's Germanna Guarantee Program. See Free Lance-Star story on Monte Carlo Night and photos of last year's event. Germanna Community College student Rosana Marzullo-Dove has been named one of the top 10 students on the 2010 All-Virginia Academic Team, earning a $500 scholarship. 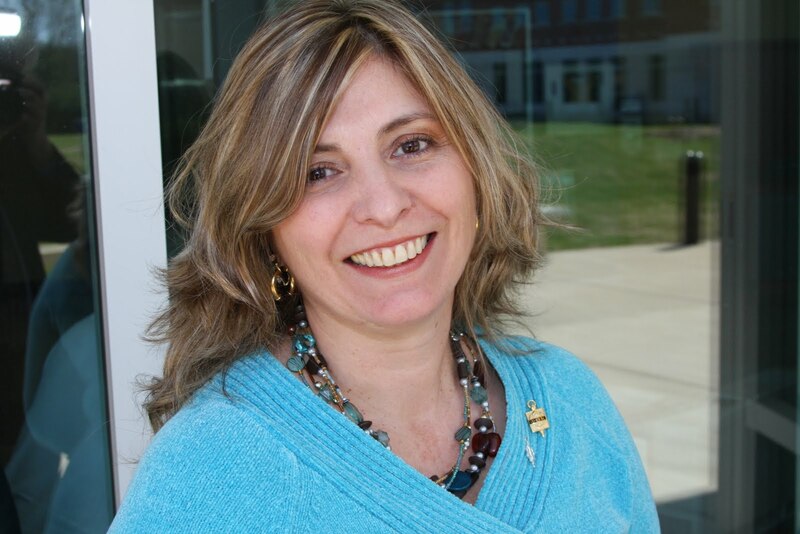 Marzullo-Dove, a psychology major, is GCC's Phi Theta Kappa Chapter President and Psi Beta Chapter Treasurer. She has also has been selected as a 2010 Coca-Cola National Finalist, along with fellow Germanna student Pamela Petzold, based on scores earned in the All-USA Academic Team competition. This program is sponsored by the Coca-Cola Scholars Foundation and is administered by Phi Theta Kappa Honor Society. National finalists win $1,000. Marzullo-Dove and the Coca-Cola Scholars Foundation will be attending Phi Theta Kappa’s 92nd Annual Convention in Orlando, Fla., April 8-10. My name is Aundrea Handy. I’m 24, and a single mother of two children. 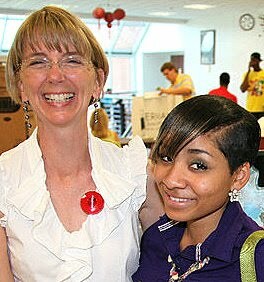 I graduated from the Germanna Middle College Program in 2009 and received my General Education Diploma. As a high school dropout, there aren’t many options when it comes to jobs: the only experience I had was customer service. Therefore, a minimum wage job was all I could get. As the economy slowed down in 2007, I began to struggle. I was living paycheck to paycheck and could barely afford my rent; then business slowed even more and my hours were cut completely. I could no longer afford my home and had to move into a homeless shelter. I was devastated; I did not know what to do next. Then I saw an ad in the newspaper for The Middle College Program at Germanna and started to think. I thought about my kids and how I didn’t want them to make the same mistakes I did. What better way to show them this than to go back to school, become a great role model, and show them that school is necessary for a better life and a great career. Going back to school to complete my high school education was the best decision I ever made. Middle College opened my eyes and gave me a new outlook on life. Everything started to fall into place, I became more confident and motivated and I even landed a better paying job. I moved out of the shelter and am now living a very comfortable, stable life and my kids are very happy. I am a Germanna student, and it feels great to say that. 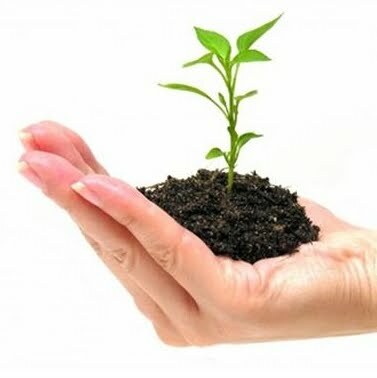 I have always wanted to be a successful businesswoman and a psychologist to help people. So I am currently taking classes to earn a degree in both Business Administration and Psychology. I hope to become an Organizational Psychologist. In this career I will apply the principles of psychology and human behavior to personnel, administration, management, sales and marketing problems. I was so happy to find this occupation, as it is also a part of human services, counseling, and mental health services which I am very interested in. This has been an eye-opening and reassuring experience for me overall. I am so thrilled to continue this journey and grateful for the opportunity that the Middle College Program at Germanna has given me. "When I see the talent out there that cannot find a job, it scares me to death," Laurie Newman of Taskforce told Rep. 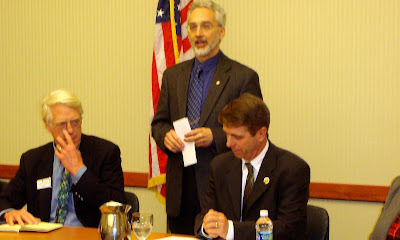 Rob Wittman (R-1st Va) today during a small business roundtable discussion with area business leaders and regional chamber of commerce members at Germanna Community College. "We have to [create] jobs, we have to have places to put them. There's no end in sight. They just keep coming and coming." The regional roundtable, hosted by GCC's Center for Workforce, was a forum intended to allow the congressman to hear directly from employers on what steps government can take to incentivize real growth. Small businesses account for 70 percent of the new jobs created each year, and Wittman said he is committed to ensuring they have the tools they need. Others at the meeting told Wittman that small, "main street" banks are ready and willing to make loans to small businesses, but are finding their hands tied by red tape. On the topic of health care reform, Wittman said he wants to end the perception of the GOP as "the party of no." He said the Democrats are expected to try to pass a reconciliation of its House and Senate health care bills on Feb. 21, four days before a summit is to be held at the White House during which President Obama has promised to open the floor to all ideas. When someone asked if the Republicans would show up for that meeting, Wittman said he hoped so. "I think we have an obligation to put forth our ideas," he said. He said the Republicans should attend the meeting to offer proposals for tort reform and allowing cosumers to buy health insurance from companies competing across state lines. "We are hopeful the meeting on the 25th is still open to ideas," he said. Greg Foley, at left, is pictured with VCCS Chancellor Dr. Glenn DuBois, delegates Ed Scott and Bobby Orrock, and his daughters. The way things are going, who's going to be "the Biggest Loser?" America, says a nationally known expert on health care and "futurist." Dr. William Rowley, a retired rear admiral in the U.S. Navy and a futurist at the Institute for Alternative Futures, says America can’t handle the truth when it comes to the health care reform debate. The nation can cut its health care expenses by 75 percent by making simple lifestyle changes like doing things as simple as throwing away the TV remote so we have to move around more and eating meals with sensible portion sizes. “The reality is that our lifestyle is the biggest disease we have in America--it’s killing us,” says Rowley, who will speak at Germanna Community College’s Daniel Center in Culpeper at 7 p.m. on Tuesday, Jan. 19 and at GCC’s Fredericksburg Campus in Spotsylvania at 7 p.m. on Wednesday, Jan. 20. Rowley trained as a vascular surgeon and has been chief executive officer of two medical centers and a large managed care organization. He was chairman of the Department of Defense Military Health System 2020 research project, which studied the future of health care and its possible impact on military medicine. Rowley is particularly concerned about what this is doing to our children, but is encouraged by efforts like “Drop It: The 2010 Healthy Living Challenge,” which kicks with a fair from 10 a.m. to 4 p.m. on Jan. 23 at Germanna Community College’s Daniel Center in Culpeper. That will be followed by a “Biggest Loser” type 12-week Weight Loss and Healthy Living Challenge with cash prizes of up to $1,000 for kids and prizes for kids including a Nintendo Wii with Wii Fit. Children are encouraged to make healthier choices, but not required to lose weight. Culpeper Regional Hospital and Germanna are teaming on this effort to help Culpeper live healthier. Rowley’s talk is part of the Drop It campaign. Rowley says: ”There are a couple of things health care reform does not tell us. No. 1 is that we’re creating far more disease than our society can afford to pay for. And that’s never gonna change unless we change our lifestyle. He notes that health care cost inflation has recently run at 17 percent a year and by 2020, will be 21 percent. “Until we start honestly talking about what’s going on in our society and putting a limit on what a third party is required to pay and change our lifestyles, we can’t change it. “Nobody wants to be politically honest about what’s really happening to our country. But we have the power to change things ourselves. Are you maintaining a normal body weight? Are you eating five fruits and vegetables a day? Do you get at least 30 minutes of physical activity five times a week—including walking? Shockingly, only 1.5 percent of men and 4.2 percent of women said yes. Studies show 70 percent of premature death is lifestyle-related, Rowley says. Today, 25 percent of Virginians are obese. Five years from now, 40 percent of all adults in Virginia will be obese. 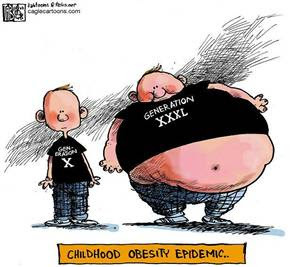 By 2030, almost 50 percent will be obese. “It's amazing how fast this came on,” Rowley says. An overweight 18-year-old has a 30 percent chance of developing diabetes. One who is obese has a 57 percent chance. One who is very obese has a risk of getting diabetes of 70 percent. Rowley says the growing obesity problem is draining America’s coffers due to related health care expenses and crippling the nation’s economic productivity and competitiveness. Rowley cited a Duke University study of its own employees that showed that severely obese employess filed twice as many workman compensation claims, had seven times higher medical costs and lots a whopping 13 times more days from work. Today there 680,000 people in Virginia with diagnosed cases of diabetes. That’s 8.5 percent of the population, and that figure is underreported and growing. About 755 new cases of blindness due to diabetes About 1500 people need dialysis because of renal failure due to diabetes. Almost 2,400 are going to have amputations due to diabetes. In the past, people didn’t typically develop type 2 diabetes until their 50s, 60s and 70s. “Unfortunately, now we’re seeing it even in teenagers and it’s not uncommon for people in their 40s,” Rowley says. They’re going to die 10 to 14 years prematurely, he said. And they will have 18 to 21 years of life in which their quality of life is essentially cut in half. Seventy-two percent of seniors--those 65 and over—either have diabetes or have pre-diabetes, which means they will develop it unless they change their lifestyles. There are 977,000 seniors in Virginia, and 165,000 have diagnosed cases of diabetes, another 140,000 have diabetes but they’ve never been never tested and almost 400,000 have pre-diabetes. Rowley says we must face reality and make simple changes in our lifestyle. “Unfortunately, once you get a chronic disease like diabetes or cardiovascular disease or high blood pressure, it’s very unlikely you’re gonna cure it. We can manage it with a lot of expensive medicines and other therapies. But once you get these diseases, they rarely go away. He says it’s vital that schools only stock vending machines with low-calorie drinks and parents make sure children’s meals consist of sensible portion sizes. The food industry, he says, has turned America into a “obesenogenic” society. The last study of the American military, in 2005, showed that 62 percent of all active duty military were overweight,” he says, and that’s in a situation where people are required to train for endurance and are weighed twice a year. “Today, the average American adult is eating 500 calories more a day than in the 60s or 70s. Kids eat 300 more. And 3,500 calories is a pound. You could be gaining a pound a week. “We have no idea what we’re doing to our bodies,” he says. “You can go to a restaurant and have a 1,000 calories as an appetitizer before you ever eat your meal. “And we’ve redesigned out environment so you don’t need to get any physical activity and our work life so there’s no time anyway. “Kids ride the bus to school and back, gym is eliminated to save money, then they go into the house and play video games and watch television,” he says. Spotsylvania Regional Medical Center has given the nursing program at Germanna Community College extra reason to celebrate the New Year. The hospital’s Chief Executive Officer, Tim Tobin, presented the college with a check for $100,000 Friday. "We at Germanna Community College value and appreciate this second donation from HCA as further testimony of our growing and mutually beneficial partnership," Germanna President David Sam said. "Their support for and trust in our nursing program will be a vital factor in our ability to produce the increasing numbers of nurses and other health professionals desperately needed in our area, especially as the new Spotsylvania Medical Center opens its doors across the street from our campus entrance. This is a promising start for the New Year for Germanna, and those in our community who need our help, thanks to HCA." HCA has donated a total of $150,000 to GCC. Medicorp has donated $1.4 million to Germanna over the years. About Spotsylvania Regional Medical Center: This technologically advanced, 126-bed hospital will open June 2010 on a 75-acre campus near Fredericksburg, just south of Exit 126 of Interstate 95 and adjacent to GCC's Fredericksburg Campus. It will have all private rooms and provide a wide range of in- and outpatient services, including 24-hour emergency care, obstetrics, advanced diagnostic imaging, intensive care, cardiac catheterization, orthopedics, and behavioral health services. Adjoining the hospital will be the Pogonia Medical Arts office building, an 80,000-square-foot complex that will house physician offices. About HCA Virginia: HCA Virginia is the state’s most comprehensive healthcare network with two dozen locally managed hospitals and outpatient centers in Central, Southwestern, and Northern Virginia. With a workforce of more than 10,000, it is one of the state's largest employers and healthcare providers. Each year HCA Virginia facilities provide approximately $100 million in free charity care to needy patients and pays $100 million in taxes that support vital community services.